Barack Hussein Obama, who said, when asked by Rick Warren when an unborn child obtains human rights,"....That's above my pay grade." If so, you should be neither a teacher nor a leader. Roland Kirk plays, "I Want to Talk About You," a piece earlier done beautifully by John Coltrane. Kirk was blind since a young age and often played several reed instruments at once. He could be his own horn section. This is why he looks like he just got off the airplane--loaded down with equipment. On this piece, he sticks to the tenor. He plays most of the ballad without stopping to breathe. This is done by using a technique called circular breathing, and Kirk was the master of it. So, be initiated into the strange world of Roland Kirk (d. 1977). blown out, blown up. Over. The end, ending, ended, End. at all, ever. But all had been given. The taken had been the Given. Mr. Parris of The Times of London believes that Christianity is essential to the liberation of Africa. The only problem? He is an atheist. Read his fascinating article. We have never met, but your ministry has had a marvelous effect on my Christian life. I converted in 1976 (at age 19) after having been interested in secularism and Eastern religions. Shortly after this, God led me to read The God Who is There, which was the most important and influential book I ever read. This helped set my course as a Christian teacher, preacher, and writer. (I am a Professor of Philosophy at Denver Seminary and the author of books and articles on philosophy and apologetics.) I also read your books, L’Abri and The Tapestry and portions of your other books. These books, along with the rest of Dr. Schaeffer’s works, laid an invaluable foundation for me. I continue to reread these works and I have recently read two new books about Dr. Schaeffer with great interest. Surely, Christianity is true, rational, and pertinent to all of life. We must take it to the world! Moreover, we must depend on Christ and seek God through prayer at all times, come what may. I want to thank you for being such a loyal, energetic, and creative woman of God. Thank you for being such a support to your husband and children, and for communicating the gospel to so many people over many decades. As Os Guinness has said, you were “the secret of L’Abri.” Without you, it would not have been possible. Although I was never able to visit L’Abri (I wish had), the stories from there live within me and inspire me. A friend of mine helped take care of you recently and told me of your ongoing love of prayer and concern for Christians around the world. That spurred me to write you in order to give you my thanks. Of course, I ultimately thank our Heavenly Father for your wonderful and memorable life. During these difficult days of your earthly sojourn (Ecclesiastes 12), I will hold you up in prayer. 1 What causes fights and quarrels among you? Don't they come from your desires that battle within you? 2 You desire but do not have, so you kill. You covet but you cannot get what you want, so you quarrel and fight. You do not have because you do not ask God. 3 When you ask, you do not receive, because you ask with wrong motives, that you may spend what you get on your pleasures. 4 You adulterous people, don't you know that friendship with the world means enmity against God? Anyone who chooses to be a friend of the world becomes an enemy of God. 5 Or do you think Scripture says without reason that he jealously longs for the spirit he has caused to dwell in us? 6 But he gives us more grace. That is why Scripture says: "God opposes the proud but shows favor to the humble and oppressed." 7 Submit yourselves, then, to God. Resist the devil, and he will flee from you. 8 Come near to God and he will come near to you. Wash your hands, you sinners, and purify your hearts, you double-minded. 9 Grieve, mourn and wail. Change your laughter to mourning and your joy to gloom. 10 Humble yourselves before the Lord, and he will lift you up. --James 4:1-10. Notice that in the struggle to submit to God and resist Satan, one must repent, even be sorrowful over sin. Without this action, real repentance and resistance against Satan is impossible. This means that one must sometimes be miserable for God. The happy face is out of place. "Grieve, mourn and wail. Change your laughter into mourning and your joy to gloom." This is required, oftentimes, for true humility to be brought forth. But then God lifts us up and we are free from the devil's schemes. You see, the devil often wants us stupefied with worldly happiness, which is not godly joy. Think on these things. I certainly need to. What false happiness is keeping you from godly repentance and real joy in the Lord? While some godly people are very well known, and might be considered celebrities, most very well known people of today--I do not mean giants of history such as Winston Churchhill--possess almost nothing worth us knowing about. As Daniel Borstin said, "They are well-known for being well-known." Their biographies--or factoids--are vanity of vanities. Their makeovers, their cars, their idiosyncrasies are not worth knowing about. Yes, they are made in God's image and need Jesus Christ's righteousness for eternal life. In that sense, they are valuable. But how much weight they have gained, whether or not they are pregnant, who they are sleeping with, is mere gossip. And gossip, the Bible tells us, is sin. Sin should be repented of, in order to please God and free us up to do God's will in his power. Life is short, a vapor. Eternity is long, an infinity. Life should be lived under the audit of Eternity, not in terms of celebrity gossip or any worldly thing (1 John 2:15-17). As Pascal said, our passionate interest in the trivial and our lack of concern for the eternal, evidences a very strange disorder. Let us repent and live for what matters most. But everywhere there was something else, too. There was oppression -- for those who were not the friends of Tiberius Caesar. There was the tax gatherer to take the grain from the fields and the flax from the spindle to feed the legions or to fill the hungry treasury from which divine Caesar gave largess to the people. There was the impressor to find recruits for the circuses. There were executioners to quiet those whom the Emperor proscribed. What was a man for but to serve Caesar? I just learned today that Mitch Mitchell, drummer extraordinaire for The Jimi Hendrix Experience (1967-70) died in November at age 61. For some reason, this hit me harder than anticipated and brought unexpected tears. So, indulge me for a moment (if you can bear it) while I reflect on the significance of Mitch Mitchell. While I cannot endorse Jimi Hendrix's worldview (hedonism, occultism, Eastern mysticism) or irresponsible way of life (promiscuity, self-destruction, illegitimate children spread all over the planet), his band with Mitch Mitchell and Noel Redding (d. 2003) was ground-breaking and virtuosic. I shall speak only of the recently departed Mitch Mitchell. One of the first albums I ever owned (or wore out) was "Smash Hits" by The Jimi Hendrix Experience, which featured a song called "Fire." You cannot listen to this without being captivated by the drumming, which is loud, sharp, sassy, and utterly unforgettable. (I shamelessly stole what I could from Mitch in a drum solo I performed this summer, taken from the first drum break of "Fire"). Mitch was much influenced by jazz, and, in fact, by the incomparable Elvin Jones, who played with John Coltrane from 1960-65. Jimi once referred to Mitch as "my Elvin." Quite so. In fact, consider the instrumental section of "Third Stone From the Son," where Mitch swings ferociously; this is very rare for rock in that day or any day. Or consider the amazing, driving 3/4 grove of "Manic Depression." How many rock songs (let along hits) have ever been in 3/4? Oh my, Mr. Mitchell! Why tears for Mitch? Another blade of grass withers and dies on the field of this parched earth (Isaiah 40:8; Ecclesiastes 12), a blade that made beautiful, explosive music for a short, bright, unrepeatable season. Tragically, we didn't hear much from the ultra-talented, Mitch Mitchell after Hendrix's early death in 1970. Mitch played briefly with a group called Ramatam (not to be confused with Ramadan), which featured a female lead guitarist. Then, essentially, that was it (that I know of). 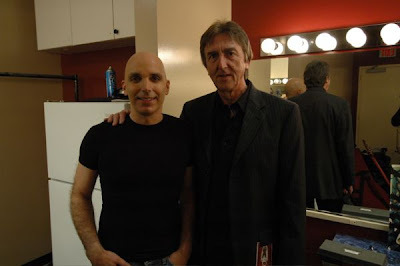 The New York Times says Mitch had just completed a tour called Experience Hendrix when he died unexpectedly in Portland, Oregon. I wonder if any of that tour was recorded or will be released. Another frail human passes into eternity, and to which part of that limitless expanse, I do not know. But it is likely that this percussionist nonpareil gained his only reward on earth. As a teenager, I tried to play like Mitch. I'm sure millions of young men like me did, too. When I now play drums (which is rare), I still try to play like Mitch (as much as I am able, which ain't much). There is one pattern in particular that lives with me. While playing a single stroke, thirty second note run on the snare, you hit an upper tom-tom once with your right hand, staying in the role. (That may or may not have made sense to you. I seldom try to explain drumming in words.) I'm not much of a drummer, but I cannot deny that "the beat goes on" in my mind, and Mitch is there. That the classroom is a sacred space, an offering to God, a place that should not ape the sensibilities of popular culture. That there is no Christ-ianity without the Cross of Christ. That Calvinism is not a cold, heartless, abstract system of doctrine devoid of biblical support, evangelistic zeal, and spiritual nurture. Think has put on line (or someone has) my article "Pascal Speaks from the Grave," which is a defense of his famous wager argument for Christian belief. Think is a British philosophy journal subtitled, "philosophy for everyone." They cater to creative approaches. My approach was to craft a letter from Pascal (from heaven) concerning an article attacking his argument. 1. Who are these two? 2. What is a good title for this photograph, assuming you can answer (1)? On behalf of this estimable blog, here are the 2008 Constructive Curmudgeon Awards. 1. 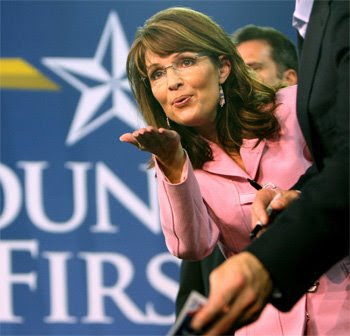 New Politician of the Year: Sarah Palin. She came out of nowhere and set the political establishment on its ear. It's too bad about her running mate, though. 2. Postmodernist Politician of the Year: Barack Obama. All image, all the time; surface over depth; pastiche over foundation; nausea, nausea. 3. Stooges of the year: The mainstream press's handling of the Postmodern Politician of the Year. 5. Old Politician of the Year: George W. Bush. His approval ratings scrape the floor; we conservatives did not like all the federal spending; the war in Iraq could have been handeld much better (an earlier surge). But consider this: The United States has not been hit by a terrorist attack in seven-and-a half years. Sleep walking (or running) Americans seem to have forgotten this amazing fact. It does not just happen of its own. Bush's policies, as unpopular as they have become--Gitmo, warrantless wire taps, the Patriot Act--are largely responsible. God have mercy on us under Obama. 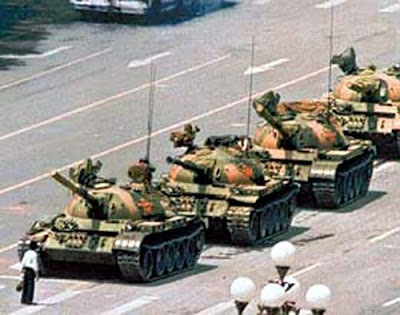 This brave young man who stared down the tanks in Tiananmen Square in 1989 was very likely executed in a Chinese Communist prison, as were the other protesters. Many Chinese today have not even heard of this historic protest, since the Communist state censors everything. This is a striking image of speaking truth to power, come what may. Christians need this kind of courage, the courage of a blood-stained (but now empty) Cross. I have started a new blog called Chronic Illness and Christian Faith. It is an experiment. Please visit if you are interested. 3 Now Herod had arrested John and bound him and put him in prison because of Herodias, his brother Philip's wife, 4 for John had been saying to him: "It is not lawful for you to have her." 5 Herod wanted to kill John, but he was afraid of the people, because they considered him a prophet. 6 On Herod's birthday the daughter of Herodias danced for them and pleased Herod so much 7 that he promised with an oath to give her whatever she asked. 8 Prompted by her mother, she said, "Give me here on a platter the head of John the Baptist." 9 The king was distressed, but because of his oaths and his dinner guests, he ordered that her request be granted 10 and had John beheaded in the prison. 11 His head was brought in on a platter and given to the girl, who carried it to her mother. 12 John's disciples came and took his body and buried it. --Matthew 14:3-12. In a brash attempt to further hoodwink evangelicals, Barack Obama has asked mega-church Pastor Rick Warren to give the invocation as his inauguration. Homosexual rights activists are apparently bothered, since Warren opposes homosexual marriage. If Warren called Obama to repent, that would be on thing. But blessing this man and these policies is simply wrong. We need a prophet. What would John the Baptist say on this auspicious occasion? Of course, his type would never be invited. They would be in prison. But the spotlight is not always the place of honor. Some souls think The Constructive Curmudgeon is, well, too curmudgeonly and not constructive enough. For that reason, let me recite some features of my church, Wellspring Anglican Church, that I appreciate and give thanks for. 1. I look forward to attending. This could not always be said, especially when I was "between churches." 2. The messages delivered by either of our two pastors are always biblical, passionate, and courageous. They sometimes even include interaction between preacher and congregation. 3. The liturgical structure is biblical, participatory, and edifying. One need not count on one aspect of the service to carry everything else. You will always be called to worship, worship, hear Scripture read, confess your sins, be assured of pardon, say the Lord's prayer, pray as a group ("Prayers of the people"), hear a sermon, receive communion, and receive a benediction. There is order and enthusiasm for that order--no dry, rote recitations here. Moreover, various symbols illustrate theological truths (but no icons). Actions illustrate as well, such as making the sign of the Cross when the Trinity is mentioned. I now do this. 4. The church is open to all manner of people. While we have many well educated folks, we also have people who have served time in jail, have come off the street, or who are not middle class. "Red and yellow, black and white" are represented, as are most age groups. There is no niche marketing, but a desire to draw in the neighborhood and beyond. 5. We also have a close connection to Africa, particularly Rwanda, since we are under several bishops there. Given my concerns for Africa, this is refreshing. Thank you, Wellspring Anglican Church. "Lo, He Comes With Clouds Descending"
Part of this was recently sung at a Canto Deo Christmas concert at Bethany Lutheran Church in Denver, Colorado. It was glorious. Of course, there many more. Neverlthess, these are not banner days for the American church. After much research, hard work, trial and error, and after consulting (and paying; they don't come cheap) a plethora of social science consultants, we have finally achieved our goal. The stakeholders are pleased; our market share is rising; our popularity is going through the roof. We have reached the ultimate reinvention. We have made religion God-free--and in the name of God! Our forms are fabulous, enticing the eyes, tickling the ears, tugging at the heart, drawing in the designer demographic. The choreography is cogent, spectacular, impressive. Our numbers are up, the complaints are down; our path is wide, our message inviting and inclusive. We have put God on a leash. It is a powerful image: God for us, in our way. We celebrate the love of God without a nasty cross; the power of God without judgment and narrowness; the presence of God without any censorious legalism on his part. O God, we are free of God! We have a Bible. Oh, we all believe it, or at least salute it at some point in the service. We don't expect you to bring your own, of course. We've moved beyond the book to the screen. We supply the multicolored, ever-moving screens. There a few positive, uplifting texts there, too--at least when it fits the mood we create. We do not mention Psalms of lament or, God help us, Ecclesiastes or Job. These do not speak to busy, postmodern people, you see. Our consultants told us so. We have no power to heal the sick, or raise the dead, or cast out demons, or call people to repentance or to worship God in abject humility and desperation. Why should we? Who does that any more? It does not fit our postmodern context; it just is not relevant. Besides, it would reduce the numbers. The giving units would shrink. How could we afford our mortgage? When people get sick and die, we try to move on. We turn mourning into laughter as soon as possible. Gold and silver we have plenty. In the name of our designer God, be happy! Be successful! Don't be negative. God believes in you! God bless us all! We have a new, better, form of godliness. We have the lights, the cameras, the action. Our seats are comfortable; our platform people are pretty. Nothing is out of line: no hair uncombed, no moment unscripted, no unscheduled episodes. There are no interruptions. We even have an emergency generator. There will be no power failures here. We have no dead air. We are busy with our program. We are efficient. We give door prizes and smile. We have reinvented God, our designer God. Surely God is pleased. We use him in so many ways. We have reinvented communion. Do it your way, in your timing, as you see fit. No old words and stuffy invocations and recitations. Whatever it means to you, it is. And we do it once in while, when our program schedule allow for it. We have made religion free of God, that old God that failed. And we blink and twitch. Hear my prayer, LORD God Almighty; listen to me, God of Jacob.--Psalm 84:8. It strikes me that I have never attended an all-night prayer meeting. These are more common where revival and renewal is breaking out, such as in South Korea and China. If you have experienced this kind of even and have any ideas for how to proceed, please let me know. The New York Times features a piece about novelist David Foster Wallace's philosophy thesis on the argument for fatalism by Richard Taylor. I will never forget reading this argument in the 2nd edition of Taylor's Metaphysics in 1977 at the University of Oregon. Wallace was quite philosophically inclined and tackled Taylor's infamous argument in a 76-page thesis, which was never published. I comment this article to you for its reflections on Wallace (who committed suicide this year) and on metaphysics. "Sometimes, Even Jesus Got the Blues"
My old high school friend, musician and songwriter, Dan Lowe, has a performance of his song on YouTube. We used to jam together back in the day (1974-5) in Anchorage, Alaska. He took the music seriously, as you can tell. (I bang on drums once in a while.) Dan, who now hails from Portland, Oregon, helped lead me to Christ in 1976. Please listen and think about the words. The sound quality is not superb, but don't let that bother you. This is heartfelt music. The Denver Seminary philosophy program now has a blog called, Out-thinking the World for Christ. Please read and comment. Let us, in Heaven's name, drag out the Divine Drama from under the dreadful accumulation of slipshod thinking and trashy sentiment heaped upon it, and set it on an open stage to startle the world into some sort of vigorous reaction. If the pious are the first to be shocked, so much the worse for the pious — others will enter the Kingdom of Heaven before them. If all men are offended because of Christ, let them be offended; but where is the sense of their being offended at something that is not Christ and is nothing like Him? We do Him singularly little honor by watering down till it could not offend a fly. Surely it is not the business of the Church to adapt Christ to men, but to adapt men to Christ. (Creed or Chaos?, 24-25). 2. Why Believe that Jesus is the Only Way? 4. The New Age Worldview: Is it Believable? 5. If there is only one God, Why are their many Religions? 8. Do Christians and Muslims Worship the Same God? I hope to get these articles back up on my own web page in the near future, but please avail yourselves of these articles before it is too late. You will also find about twice or three times as many articles by the prodigiously prolific and cogent J.P. Moreland as well. Listen to a recent lecture by Os Guinness, "Survival of the Fastest." Os is one of our greatest, Christian social critics. The acerbic, comedic, but brilliant Mark Steyn (author of the must-read America Alone) has written a penetrating piece on the recent Muslim terrorist attacks (there, I said the truth) in Bombay, India. The Western press, fearing charges of Islamophobia (a nonexistent illness created to avert criticism of Islam), typically fails to note the Islamic ideology behind terrorism worldwide. But when we do not know the enemy, we have no chance of protecting ourselves from that enemy. I have discovered that at least one person is playing games with me through aliases on this blog. When I found this out, I banned the person, and will ban anyone else I catch in prevarications. I appeal to all who post here to use your real name and to not construct identities for nefarious purposes (or supposedly good purposes). Ever learning, and never able to come to the knowledge of the truth--2 Timothy 3:7 (KJV). One of the many blights on the contemporary intellectual landscape is the notion that we can leave epistemology behind: that is, to transcend the need to justify assertions of fact. Descartes is commonly blamed with the turn to epistemology as central; and, of course, we must leave the old, fussy Frenchman behind. All that was written in order to present this quote from Francis Schaeffer from He is There, He is Not Silent (1972). "Unless our epistemology is right, everything is going to be wrong." My student Sarah Geis used a provocative word today in a discussion: de-image. We are choked by images that hide realities. How might we de-image our lives to regain reality? Please read Charles Colson on "Walking and Talking: Pro-choice as Rhetoric." Exodus 21:22-25 stipulates OT case law for two alternative consequences of a pregnant woman being accidentally hit by men who are fighting with each other. The first consequence (case 1) is set forth in vs. 22; the second consequence (case 2) is set forth in vs. 23-25. The text admits of various interpretations, which generally fall into two different views, each of which arises out of a different translation of a key phrase. Generally speaking the two views turn on whether the Hebrew text in vs. 22a is translated so as to say the woman gives birth prematurely (view 1), or is translated to say the woman has a miscarriage (view 2). View 1 permits either a live birth or a miscarriage. View 2 permits only a miscarriage. The first view is represented by the TNIV. The second view is represented by the NRSV. TNIV, Exodus 21:22-25: "If people are fighting and a pregnant woman is hit and gives birth prematurely but there is no serious injury, the offender must be fined whatever the woman's husband demands and the court allows. But if there is serious injury, you are to take life for life, eye for eye, tooth for tooth, hand for hand, foot for foot, burn for burn, wound for wound, bruise for bruise. NRSV, Exodus 21:22-25: When people who are fighting injure a pregnant woman so that there is a miscarriage, and yet no further harm follows, the one responsible shall be fined what the woman's husband demands, paying as much as the judges determine. If any harm follows, then you shall give life for life, eye for eye, tooth for tooth, hand for hand, foot for foot, burn for burn, wound for wound, stripe for stripe. However, the Hebrew text does not say “there is a miscarriage.” It says, “her children come out.” The KJV quaintly puts it, “so that her fruit depart from her.” The text does not require the death of the fetus, but rather offers the possibility of either death or survival. Thus view 1 is a more literal and accurate rendering of the text, and also allows for the woman’s offspring to come forth unharmed. According to view 1, verse 22 (case 1) speaks of a scenario in which the woman is hit and “her fruit departs from her,” yet her “fruit” remains alive and well and the mother sustains no serious injury. (I couldn’t resist the KJV language here.) The man who hit the woman must then pay some agreed-upon compensation. But if, as in verses 23-25 (case 2), the woman is hit and the child or the woman or both sustain serious injury or death, then the offender must be punished in accordance with the severity of the injury or injuries. However, OT law required capital punishment only when the killing was willful and premeditated (see Numbers 35:31). Therefore, even if the mother or child or children were killed, the man responsible would not be required to die, but could ransom his life by surrendering to the father and/or husband of the deceased a monetary payment equal to the value of the life lost. On this view, the fetus is deemed a human life—a life whose serious injury or death cannot be compensated merely by a routine fine, but must be addressed by the same means as any accidental injury or fatality of any human being. Regarding the contemporary Jewish understanding of this text: The Jewish Study Bible (Oxford University Press, 2004) sets forth various views on this text. The view that considers the unborn fetus to be not a living person because only a monetary punishment is required for its death (Halakhic exegesis) concludes from this only that “abortion is permitted when necessary to save the mother”—which is a pro-life view! The Bible never makes any provision for anything resembling potential life or pre-human life or considerations of quality of life or any of the other contrived notions devised in our modern/postmodern/post-human culture. A respect for human life at every stage of life is consistently upheld throughout the Bible. This view is consistent not only with the literal reading of the text itself, but also with the overall tenor and teaching of Scripture. Biblical truth is rightly discerned not only by careful exegesis of the text itself, but also by incisive assessment of that which, although not explicitly stated in Scripture, is logically entailed by what the Bible says. 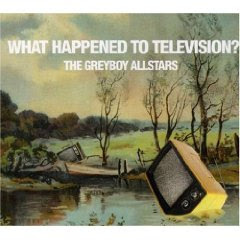 I don't know anything about this group, but saw this CD cover in a store today and liked it. Now I present it to you. But the problem is that the TVs should not be littering the country side. Instead, they should be put safely into the city dump. Review of "Are All Religions One?" Robert Velarde has written a review of my booklet, Are All Religions One? (InterVarsity, 1996) on this estimable blog. This booklet has sold over 50,000 copies over and continues to be in demand. For this, I am grateful (and not for royalties, since I was paid a flat fee for it long ago). While reading Michael Horton's generally excellent book, Christless Christianity, it struck me with considerable force why so many Americans recoil from "organized religion" and why they favor an undefined "spirituality" over religion. Would any sane person desire unorganized courts or an unorganized police force or an unorganized medical service? Of course not. In these areas knowledge and authority are recognized as necessary. But when it comes to spirituality, we are on our own. There is no objective and knowable authority, supposedly. The individual soul discerns what it takes to be sacred (for a season--or a weekend). But organized religion--religion with creeds and offices and a remembered history--well, that just tramples the untrammeled Self. It imposes (another hated word today) on our dispositions. It challenges the authority of the "I." Yet we fallible creatures need knowable and objective truth that is authoritatively delivered from longstanding institutions based on perennially binding sources (the Scriptures). We do not need to reinvent; we need to remember and repent. We do not need style; we need sacrament. We do not need more experiments with the ego; we need proper worship. We do not need (another) make over; we need to be born again. We do not need a new business model; we need an ancient gospel: Christ crucified for us; Christ risen for us; Christ coming again for his own. We need another new experience; we need faith in the truth of the gospel. We need the knowledge of God in relation to ourselves, others, and eternity. Organized religion--doctrine based on biblical truth, proclaimed and defended--is just what we need. Moreover, it is what God himself requires of us and gives to us! Jesus Christ is the head of this organized religion, his Body. He is the author and perfecter or our faith, the faith given once and for all to the saints. Get religion. Get organized religion. Believe in and confess that Christ is Lord before the world and in the company of the committed.